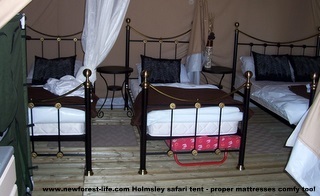 New Forest Holmsley Safari Tent luxury under canvas. 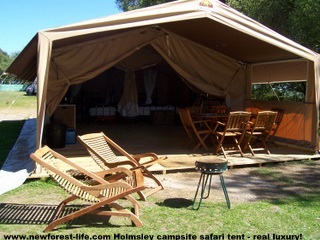 A New Forest Holmsley safari tent in the New Forest is no longer available and wont be introduced for the future either. I've left the review up so that you can see what the tents looked like, just in case you can find another area of the UK in which to book a safari tent holiday. 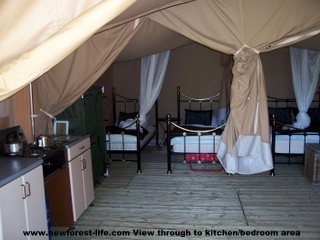 If these tents are ever reinstated, you will get an idea from my luxury camping review what to expect. 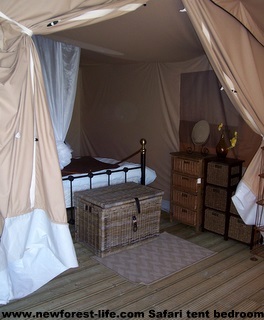 When I stepped into the Safari tent I was really surprised! The beds are proper beds and have thick, normal mattresses too! How great is that - you also get a mosquito net round each bed which if it is a hot night will be helpful too! You can divide the bedrooms up really well and there is also an additional pull out bed too - but check when booking please! You can just glimpse the kitchen area but here it is in all its glory! The kitchen area is a great size and offers you simple camp cooking facilities - but while you are cooking you can chat to your guests as they sip wine and beer from the lovely wooden furniture laid out on the decking! Hopefully you will be BBQ-ing because the weather is so good! 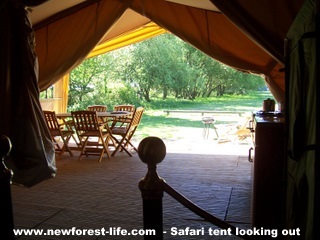 Just imagine waking up from a luxury night under canvas and looking out from your brass bed to this lovely New Forest campsite view. The ponies aren't allowed in so you wont be up close and friendly and you wont have lost your food either or suffer any "deposits"
You even get a trunk at the end of the bed for storage. 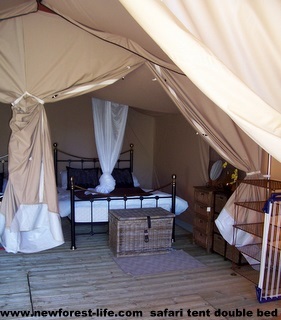 This was a really great way to experience luxury camping in the New Forest. 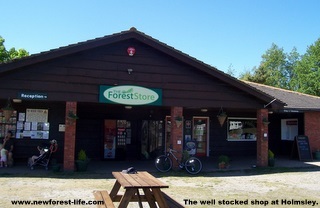 Apart from all the usual on site amenities the shop at New Forest Holmsley camping ground is well stocked and Reception is run by friendly helpful staff too! Latest news! 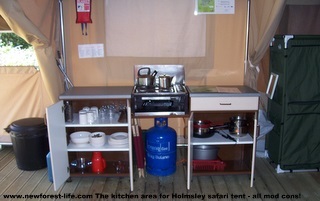 If you are thinking of booking luxury camping in the New Forest Eurocamp are NOT providing this service.